This article was written By Josh Samford on 03 Jul 2013, and is filed under Reviews. Sitting down to write a review of Confession of Murder should be a relatively easy thing to do. It’s a film that packs together some absolutely incredible action sequences, some easy-to-decipher social commentary, and plenty of twists and turns along the way. Yet, for all of the really great things about the movie, it remains difficult to write about in digest form. It would be much easier to talk about all of the specifics and minutia, but how do I approach this opening paragraph and describe the movie? What easy-to-use terms could I splice together in order to describe the movie and what it all means? On the whole, the best way to describe the film is “satirical thriller”, two words that may appear odd together, but best encapsulate what Confession of Murder does at its core. Featuring a story that hopes to humorously shame a culture that is often too fascinated with appearance, notoriety, and general celebrity obsessions, Confession of Murder also takes the viewer away from its comedy and presents a dark and dangerous world that is inhabited with intense violence and ulterior motives. While this probably sounds like a situation in which the film would very easily slip into a tonal mess, the film is surprisingly strong and concise in vision. Truly, it is a film that is most easily described by the details that make up the whole, but the sum of its contents aren’t bad either. On July 3rd, the New York Asian Film Festival will be screening Jeong Byeong-Gil’s (director of the Korean stuntman documentary Action Boys) latest feature, Confession of Murder. The plot follows several years in the life of Lieutenant Choi Hyung-gu (Jung Jae-Young), an officer who has his life forever altered by a serial killer who has managed to kill ten women. When we first meet Lt. Choi, he is incredibly close to catching this murderer. 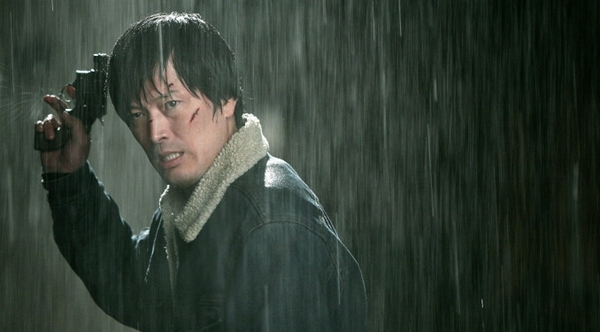 After a brutal chase sequence, the killer manages to get away clean, but not before leaving a scar across the face of Choi. We skip forward fifteen years and discover that the the statute of limitations are up for this crime. 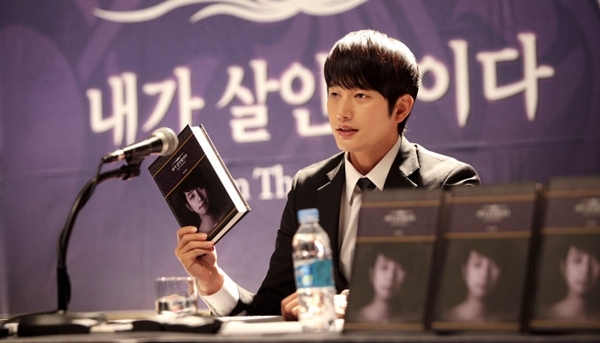 Choi is still haunted by the case, which has destroyed numerous families (including his own), and things seem to move from bad to worse when Lee Doo-seok (Park Si-hoo) hits the scene. Lee claims to be the killer, having kept his identity hidden until he was able to reveal himself to the general public without fear of police reprisal. Lee begins to apologize to the families of his victims and writes an instant-best seller named “Confession of Murder.” Lee tries his best to apologize to Choi, but finds that the inspector feels that this man is a con artist and not worthy of media attention. In the meantime, Lee does indeed become an immediate celebrity. With his dashing good looks, the young girls of South Korea become infatuated with the purported murderer. In order to solidify his reputation as the killer, Lee invites Choi onto a televised debate. When the two meet, something very surprising happens. The show receives a live call-in from another man, one who identifies himself only as J, who claims to be the real killer. Who will be shown to be the real killer, and is there anything that can be done about these brutal unsolved crimes? I can think of no better advertisement for Confession of Murder than simply describing the very opening to the film. Although it does not do an adequate job of preparing the viewer for the rest of the movie, the opening does offer an extraordinarily high dose of adrenaline. The film starts off in a small town bar as we focus on a cast of characters. There are numerous worn faces in this bar, and it seems as if the film is about to tell us one of their stories. However, without notice, a man wearing a surgical mask throws another man, wearing a denim jacket, through a window. The two begin to violently fight, using a variety of martial arts/brawling styles. One of the men tries to lock in a triangle choke at one point (a move, by the way, popularized in MMA and practiced in Jiu Jitsu), but is thrown against the wall for his troubles. Quickly, we see the man in the denim jacket pull out a gun, only to finally understand that he is a police officer. The man in the surgical mask grabs one of the female bar patrons and holds her hostage, but soon slits her throat before making his getaway. From then, we get a ton of hyperkinetic visuals as they make chase in the rain. There’s even a first-person-perspective tracking shot that seems as if it was shot from a skateboard. The sequence continues and contains more Fukasaku-esque handheld visuals a la Battles Without Honor and Humanity, but the camera defies all logic and begins floating up above buildings and traveling along with these two rivals as they jump from building to building. Inevitably, we come to a dead end and the killer, wearing his hat that covers his eyes and his surgical mask that covers his face, seems as if he’s going to give up. He has one last trick up his sleeve, however, and he tries to run and vault from one building to the next, only to partially land on a hanging neon sign. He crash lands to the ground, barely avoiding death, but when our officer makes it to the ground, he finds the killer missing. Before he can search the scene for a new route, the killer dashes from out of the shadows and stabs the police officer in his chest. The two speak vaguely about plot elements that won’t be revealed until much later, but the scene doesn’t culminate until our villain takes his knife out and gives the officer a slit across his cheek that obviously resembles Heath Ledger’s Joker from The Dark Knight. All of this happens within the first six minutes of Confession of Murder and it showcases a very large element within the film: large action spectacles. After that opening, which moves at an absolutely breakneck pace, there’s no way that the movie could ever truly hope to keep up, especially with the extended running times of Korean films nowadays. However, the pacing for the film is actually quite fluid. While the movie first introduces itself to the audience as a shocking thriller, it does a better-than-expected job of transitioning into dark comedy. The humor is very subtle and, behind all of it, there is a tinge of anger felt within the movie. Throughout much of the film, Confession of Murder acts as a satirical take on media, criminal obsessions, and the general idea of celebrity and what is warranted to become one. Confession of Murder is so spot-on when it covers the strange fixation that we have with celebrities that it almost becomes cringe worthy. When Lee Doo-seok is introduced and many young girls are shown falling head-over-heels for him, American readers may be reminded of the line of Twitter posts that erupted after the Boston Marathon bombings from young girls raving over alleged bomber Dzhokhar Tsarnaev. Others may may be reminded of the Russian spy Anna Chapman’s sudden dose of popularity. As a personal anecdote, I once had a friend-of-a-friend who spent hundreds of dollars on an acoustic guitar that he mailed to Charles Manson. Simply, our culture is infatuated with fame, regardless of the reason for that fame. Satires like Confession of Murder, however sharp they may be, are usually lacking in heart, due to the hyperbolic, and often self-aggrandizing, nature of the subject of satire. Using pawns onscreen, in order to play up select segments of society in such a way that it becomes clear to the audience that they either have a hypocritical or immoral nature to their beliefs….well, it doesn’t lend itself well to three dimensional characterization or heartfelt drama. Rarely is satire completely fair or without bias in its assessment, so it is hard to develop protagonists who do not inevitably come off as preachy. In regards to bias, Confession of Murder is no different. The metaphors and commentary are rather easy to spot, and this comes about due to rather absurd plot devices that are borne from characters devised solely for the sake of satire. Yet, the melodrama that often dominates South Korean cinema is what gives the film its heart. Lt. Choi, played impressively by Jung Jae-Young, is a haunted character who develops in a very mature fashion throughout the course of the movie. The reasoning behind his chase is never divulged in vivid detail until the film finally begins to wind down, but by that point, Jung Jae-Young completely won me over. His character is a no-nonsense everyman, but his emotions are real and throughout the movie. With all of this said, I’m still rather stuck trying to lump my thoughts together on Confession of Murder. I believe that mileage will vary from viewer to viewer, but overall, the action and excitement that the movie provides will be enough to entertain the majority of viewers. For viewers who are looking for something else to dig their claws into while watching, the social commentary is worthy of discussion. However, Confession of Murder is a movie comprised of many elements, and many viewers are likely to walk away from the movie wishing that it had more of one ingredient over the other. Yet, if approached with an open mind, I think viewers will find an incredibly smart and adventurous black comedy/action thriller that should not be missed. Confession of Murder is screening at the Walter Reade Theater on Wednesday, July 3rd at 3:00pm as part of this year’s New York Asian Film Festival. For more information and tickets, go here.